“Leading through adversity”, “The Economic Malaise and its Perils”, “Creating Economic Dynamism” – these are some of the panels taking place here in Davos at this year’s World Economic Forum. For many of us here these discussions boil down to this: How can the battered global economy bounce back and stay strong? There is no silver bullet, but what is clear is that we must create jobs and tackle income disparity as a matter of utmost urgency if we are to get back on our feet. Doing nothing is something we simply can’t afford. Allowing the jobs crisis to deteriorate further, particularly among young people, would sow the seeds of more social unrest and leave long-lasting scars on the very fabric of our society. I believe this is a widely shared view among the hundreds of government and business leaders and civil society representatives gathered at the annual forum in the Swiss Alps. The numbers are stark and getting worse. The ILO’s Global Employment Trends 2013, which came out just a few days ago, shows that unemployment is on the rise again. This is not only affecting crisis-hit countries but is spreading to other regions. The number of unemployed is expected to top 200 million this year. Almost 40 million have dropped out of the labour market because they are too discouraged to keep looking for a job. Those regions that managed to buck the rising unemployment trend are often experiencing a worsening in job quality and an increase in the number of workers struggling to survive on their income. The situation is particularly bleak for young people. Close to 75 million youth are unemployed, and more and more of them experience long-term unemployment right from the start, which seriously hurts their chances of a decent future. Another recent ILO publication, the Global Wage Report 2012/13, shows that global wage growth has been slowing, increasing the risks of lower demand and slower economic growth. At the same time, a bigger share of the national pie (GDP) has been going to the owners of capital, and less to workers. No wonder public dissatisfaction and social unrest have reached dangerous levels. Everywhere I’ve travelled to over the past months – from Europe to Asia to Africa – I’ve heard the same messages: jobs are disappearing, inequalities are rising. 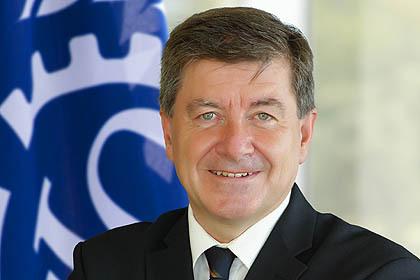 The ILO has warned for years that income disparity threatens to reverse the gains of globalization. The World Economic Forum has taken up this warning for the second year in a row. Its Global Risks 2013 report rates severe income disparity as the top risk facing the global economy. Allowing wages to catch up to productivity is not only the fair thing to do; it also makes economic sense as it helps boost consumption. Boosting consumption will in turn convince the private sector to start investing the trillions of dollars they have in reserves. Strong job growth will not come back until companies feel confident about the economic outlook. To get there, policy-makers should concentrate on four interrelated issues: tackling political uncertainty, coordinating action to support demand, addressing labour market mismatches and focusing on youth unemployment. This is not a regular, cyclical downturn that corrects itself automatically. Failure to act quickly and decisively could lead to many more years of gloom. This entry was posted in Posts by the Director-General and tagged Davos, Economic crisis, economy, employment, jobs, wage, WEF, World Economic Forum by ILO Blog. Bookmark the permalink. Guy, in the Swedish press, an article in Dagens Nyheter, DN, you came out as praising the Swdish PM Reinfelt, when in reality his government has abandoned full employment policies, made a mockery of labour market policies, destroyed the unemployment insurance and the health/sick insurance to such an extent that misery has increased and the number of people outside the labour market has increased. Reinfelt may have done less harm than other governments, but it is a pity you were quoted as satisfied with his policies. The same unfortunate impression is given in the article in the Dagens Nyheter of Sharan Burrow’s statement about PM Reinfelt’s policies Both of you appeared to my opinion too positive to his policies, giving him an international carte blanche. I am sure that was not your or Sharan Burrow’s intention.